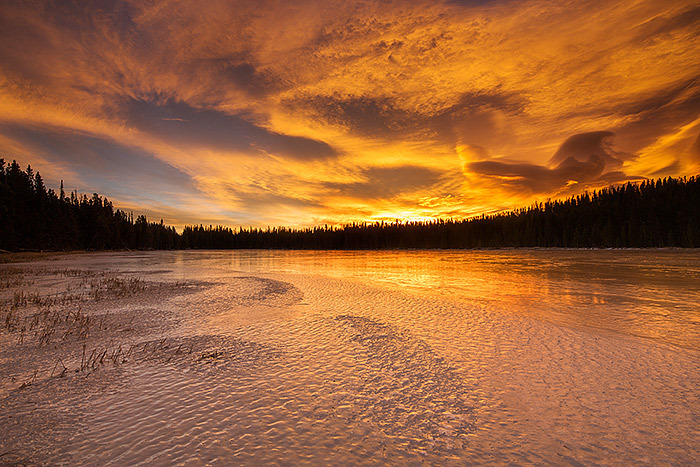 A beautiful late season sunrise unfolds in the skies over Bierstadt Lake. The frozen surface of Bierstadt Lake reflects the beautiful orange and blue hues in the sky. Bierstadt Lake garners it's name from famous nineteenth century landscape painter Albert Bierstadt. Bierstadt was known for his dramatic and colorful landscape depicting the landscapes of North America. The skies this particular morning at Bierstadt Lake would fit right into place in one of Bierstadt's dramatic landscape paintings. Photo © copyright by Thomas Mangan.